The Social Network of Things — Causeit, Inc.
Machines, like humans, have their own relationships. This research was compiled with generous funding from NTTi3, the platform IT company. An introduction the Social Network of Things: Causeit's CEO MJ Petroni, a cyborg anthropologist explains what our future might hold for data, privacy, innovation and business models. Fundamentally, to understand how humans are changing, we have to look not just at how humans relate to other humans, but at how machines relate to other machines—and how humans, machines, purpose and data coalesce and re-coalesce constantly into new kinds of beings. We can think about our progression in the relationship between humans and tech in terms of overlapping eras or ages. Right now, the Industrial Age is coming to an end, and the Information Age is rising. The future will take us into new ages and we can begin now to forecast those and consider the new problems and opportunities they might present—looking into the distant future (20-100 years) we are beginning to look seriously at the Cyborg Age and even further out to the Singularity which is at the horizon. We can examine the trends around an Internet of Things (or #IoT) and its progression into what we’ll call a Social Network of Things (or #SNT). We look at the horizon many years out as a way to pull our minds towards a future which demands technological and cultural shifts which we might want to start working towards with intention and purpose. At the apex of the Information Age is the Social Network of Things—a time when devices and people are connected through pervasive internet access, a rich web of sensors, advances in artificial intelligence, deep APIs and cultural changes. Beyond the Information Age lies what seems like science fiction to most people—the Cyborg Age followed by the Singularity. When we reach the Cyborg Age we’ll be considering not just devices and networks, but changes in the idea of what makes a human a human. For example, what will our bodies be like when implants—including into brain and nerve centers—are not only possible but commonplace? What will happen as robotics advance—how will that change the future of work and labor? What happens if the once far-fetched but now seemingly possible option of ‘uploading’ our consciousness into the cloud arises—should we consider it? How would that change us as a species? You can think of the progression of these concepts as a journey from our entirely human identities to that of an augmented or even post-human state. It’s important to note that this article is not advocating for a particular endpoint or set of ethics or values here so much as describing changes that are already happening and some of their potential outcomes. View our constantly-updated magazine of Social Network of Things content from around the web. Right now, many individuals in the world are participating in (or at least affected by) the peak of the Industrial Age. When we talk about things and devices we are still thinking of made, physical objects or resources. While many people use the Internet and digital devices in their daily lives, the technological experience of most of the world’s citizens does not look anything like the web of cutting-edge, well-connected devices described by the “Internet of Things.” At the same time, the leading edge of the tech industry and tech-assisted devices is somewhere between the Internet of Things and the full possibilities of the Social Network of Things. We’ll briefly touch upon the almost science-fiction like futures beyond the Social Network of Things, too, as a way to conceive of the infrastructure and architecture we need to be building now—both technologically and societally. 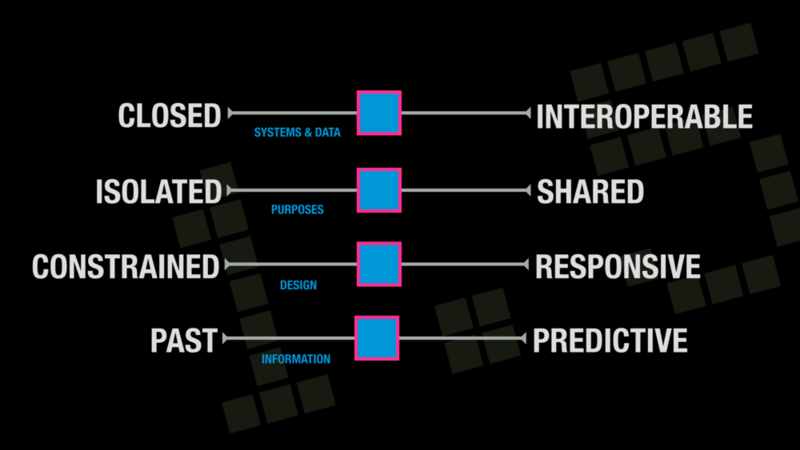 There are six key paradigm shifts which we can use to create context for the emergence of the Social Network of Things. Mark Bonchek first articulated these shifts in his Harvard Business Review article, “Putting Facebook into Perspective” in 2012. The shifts are driven by—but also require—new kinds of innovation on a cultural, organizational and individual scale as we head to the Information Age. This model is incredibly useful for talking about what businesses and organizations need to do to stay culturally relevant in the 21st century; however, for our purposes here, we’ll list them briefly as indicators of the increasingly networked and system-oriented future which the Social Network of Things is a part of. Organizations are moving from hierarchies to networks. Leadership is moving from controlling to empowering people. Business strategy is moving from making products to building and maintaining platforms. Media is moving from the concept of the audience to that of community. Individuals are moving from consumers to co-creators. Brands are moving from broadcast-style push approaches to conversational pull-based approaches. One very important change which these shifts require is in the way we think about business and organizational models. Traditional information technology skills and infrastructure such as networking, database management and internet access are more important than ever. 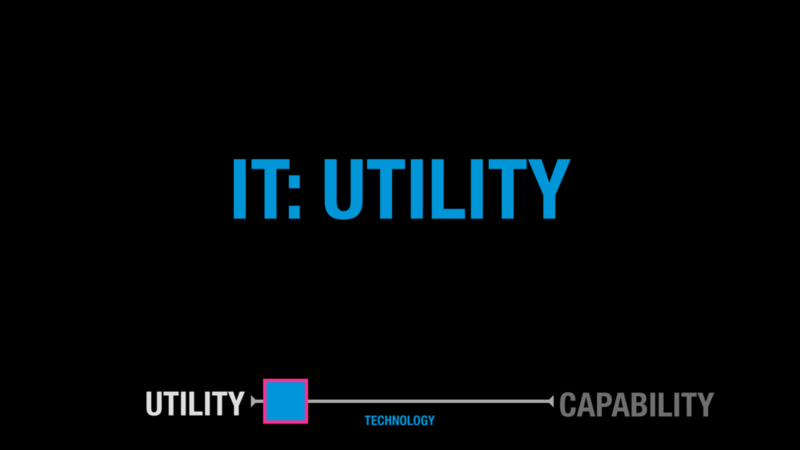 However, organizations must shift their focus from IT as a utility—basically confined to a single department in a business—to informatics as a capability. IT used to be thought of as the 'pipes' of the business world, a necessary expense to ensure functioning of material processes like products manufacturing or service sales. In other words, IT was a utility which enabled analog products to function more smoothly. Now, organizations must gain ability in informatics: the strategic capability to capture data and organize it into meaningful information, through a spectrum of technology tools everyone in a digital business environment needs to be aware of. Informatics as a capability is the strategic ability of a company to consider the impact of business decisions on their technology needs, as well as the impact of technology decisions on the entire chain of value from concept to production and maintenance. This means that each person in the company must have at least a conversational ability—if not fluency—in top technologies which impact their business. For example, in many companies marketing and branding departments were the first business units to begin to bring their own technology savvy to bear on their work, sometimes in accidental or intentional conflict with existing IT policy. Whether through third party vendors like agencies, or because they chose to hire their own technologists, marketing and branding departments have shown us that IT cannot be limited to a ‘come and fix it’ utility within the business. For a tangible example of how such thinking needs to be expanded, consider ArchiMate’s great whiteboard animation of the importance of enterprise architecture in a platform-based business. For platform-centric businesses to be successful, every person involved must be fluent in the technology decision-making process on a strategic level. Much of the technology required for a more advanced state is already here in the initial phases of the Internet of Things. The substantive difference between the Internet of Things and the Social Network of Things is actually more about the need for us to change the way we think about and use networked systems: moving away from thinking in terms of objects and humans and instead thinking of the world in terms of agency and cyborgs. These conceptual shifts are deliberately messy constructions. When we have fully made this transition in our thinking, we will have reached the Social Network of Things (SNT). This next paradigm is partially explored by Bonchek and Choudary, but deepens in impact when you apply it beyond the conception of social products (useful, as the business portion of a larger trend) and platforms (again, a business-centric view). Both Bonchek and Choudary allude to (and understand) the larger shifts: that as we progress technologically it is less and less possible to decouple humans from devices and the shared purposes which bring them together. The SNT touches on many of the same technologies which begin to emerge in the IoT. When the Social Network of Things comes into full being, platforms will be fully interoperable, sharing data and computing resources among many devices and purposes seamlessly. The SNT touches on many of the same technologies which begin to emerge in the IoT, like the cloud, machine learning and platforms—but it also begins to explore the implications of those technologies. Terms like Little Data™, the data surrounding individual users, will emerge alongside Big Data. Issues around robotics and new applications thereof—like robotic architecture which changes the fundamental shapes of buildings in response to their occupants or the weather, or to the concept of driverless cars—will bring about new functional and ethical issues. For example, how do we manage the negotiation and mitigation of risk between devices, such as two driverless cars coordinating with each other to avoid an accident? At this point in the progression toward the SNT, systems and data have become interoperable and leverage rich APIs. Purposes for devices become highly shared, much as our smartphones have, so that our cars display our calendars, share processing power and network connectivity with a connected phone, serve as sensors and even power storage units on larger utility and transportation grids. Design by our engineers and developers is premised in responsiveness—the ability to make adaptive, resilient platforms and devices which can change as their circumstances and users evolve. Information in this phase, unlike the simple tools at the beginning of the IoT Age, will take real-time information about the present and predict the future. In order for our devices and networks to provide predictive information about the present, the transition to the SNT will occur on platforms which require interoperability, strong machine learning, and robust network bandwidth. Platform thinking will have become a de facto business strategy and technology doctrine. By today’s standards, the flow of data and evolution of devices will look more organized and reliable, but the overall technology landscape may look overwhelmingly chaotic and messy, because a very high rate of change will mean that we have as much culture work to do as coding. The challenge is that the digital divide—the gulf between not just the haves and have-nots, but the knows and know-nots—will widen. Those with access to the right technology, bandwidth and tools will have exponentially bigger capabilities in business, health and other critical domains. Disparity will start to appear as much or more along educational and bandwidth-access lines than national identities, as globalization and urbanization play out. At the same time, machines will be learning on their own, increasingly automating the tweaks to their algorithms. All of this will result in entirely new opportunities for value, new markets for services, products and platforms, and the ability for users to move to co-creators of their online and offline lives. 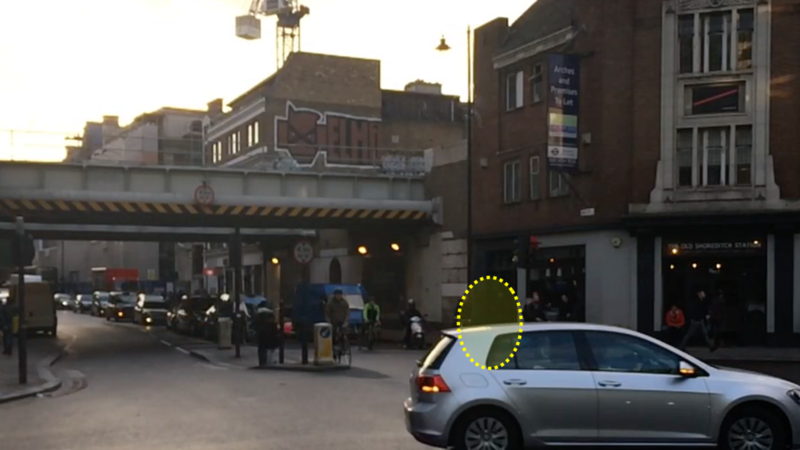 [Video pending upload and not yet active] This video shows a pedestrian in London crossing active traffic and how limited the options for conventional drivers are, posing questions about what is possible for the driverless or augmented-driver car. In the automotive example of the Social Network of Things, devices have multiple shared views of the world around them based on shared purposes like preventing collisions or easing traffic, enabled by pervasive network access and robust platforms for real-time machine learning. In a real-life example where the SNT could have made a huge impact, a pedestrian crosses a busy street without a crossing signal. The first vehicle to pass by him taps its brakes quickly and then chooses to keep driving. The pedestrian runs between this car and another van behind it, which doesn’t even touch its brakes. In the world of automated vehicles, we have the capacity to ensure his safety and that of the drivers through the transmission of data between multiple devices and people instantaneously. For example, the humans here couldn’t convey from one vehicle to another what they had seen, or how they made the judgement call they did—but an automated vehicle could. How do we design systems which can tap into the full potential of a social network of things—leveraging sidewalk sensors, the on-board systems of both conventional and driverless cars, traffic cameras and everything else available in the digital world—to augment human capacity? Even more complex is the possibility of having these devices not just inform each other, but negotiate an outcome. Let us suppose that two driverless vehicles identified an imminent crash. Without being able to communicate with each other, as is currently the case with most driverless technology, the vehicles have to guess about what the other vehicle is going to do and use their on-board information to try to avoid or at least lessen an impact. If those cars could coordinate their decisions, they could synchronize their trajectory to more reliably lessen or avoid an impact altogether. Life in the age of the Social Network of Things—at least, properly implemented—is potentially safer and easier. At this stage, we are doing something which has never been done before: negotiating between devices without passing decisions through humans first. In the world of mobility, we are attending to multi-modal transit, major safety issues and even the possibility of ultra-light vehicles which rely on intelligence, rather than mass, for safety. Some cars will be fully automated, while others will be augmented with simple systems like accident avoidance and traffic routing, and yet others will be basic machines little different than the cars of the late 1990s. It is this complex landscape of old and new technologies which is the reason why future devices must be built to be adaptable, extensible and able to communicate between each other. Right now, tech industry leaders are starting to conceptualize and release products which are designed to operate somewhere between the Internet of Things and the Social Network of Things. Nest, the learning thermostat released in 2011, does some very smart and helpful things. It employees machine learning technologies to discover the patterns of users’ heating and cooling habits, and coordinates between multiple thermostats in a network. Nest also allows users to remotely view their heating and cooling usage, and to set smarter patterns for their own use, from their phones and browsers. As the platform evolved, Nest Protect was released, bringing simple machine learning to smoke and carbon monoxide detection. Unlike most other home smoke detectors, Nest Protect connected to other Nest Protects placed in various locations throughout the house to coordinate responses to emergencies, providing smart information like “there is smoke in the upstairs hallway” rather than a simple alarm. Perhaps most useful was its ability to both learn from users’ kitchen usage (simply by waving a hand under an active Nest Protect, a user could disable it temporarily while also teaching it that that type or smoke—or time of day—might indicate that someone was cooking dinner, rather than a more serious safety threat). At the same time, alerts on the device would remotely trigger users’ mobile apps, letting them know that an alert was going on even if they weren’t home. None of those functions, however, goes beyond the potential of the Internet of Things concept. By giving the user the ability to write “if this, then that” constructions (such as “if the house is empty, turn down the thermostat and turn off most of the lights”), the Nest ecosystem immediately responds to the user’s needs but also learns from all of its users globally about potential uses for its system—shifting from conceiving of individuals as consumers, instead viewing them as co-creators of the products, services and platform. The beginning of the SNT introduces terms like prediction, automatic machine learning and more into the discussion alongside the existing concepts from the IoT. In this transitional state, open and shared platforms will be in early stages, with widely-varying levels of flexibility and interoperability from one platform to the next, posing challenges for individuals and organizations alike as they try to identify which platforms (such as operating systems or device standards) to invest their time and resources into. The nature and movement of information in the early years of the SNT will trend towards increased speed, access, and personalization. Systems and data which were once closely guarded and proprietary will become interoperable as platform thinking is adopted by most successful organizations, and the products those companies create will begin to collaborate towards shared purposes. Increased connectivity and infrastructure make information available instantly to entire networks, and users can access real-time data through their personal devices. As people grow accustomed to their tech knowing about their needs and preferences, an expectation for personalized design makes “one size fits all” devices a thing of the past. Many of the problems and benefits of the Social Network of Things are beginning to have an impact right now, in the transitional period. Our old systems are sharing space and purpose with new systems which operate under entirely different assumptions, and organizations struggle to find solutions which allow them to keep what’s been working and simply integrate the old tech with the new. As the pace of business continues to accelerate, companies can no longer afford to use traditional, inefficient styles of communication and governance, and are turning to outside companies, consultants and thought leaders to help restructure the way decisions get made. Privacy and identity politics are tense issues of discussion and legislation, as the collection and use of data becomes increasingly invisible to individuals, with new roles calling for experts who can manage the ethical questions that arise and manage the impact of reputation and brand that come with security failures. Machines are managing much of their own data collection and exchange now, with the capability to learn automatically, deliver information right when it’s needed, and respond and adapt to one another using feedback loops. While the access to all this data creates serious security challenges, it also makes entirely new value possible, especially in personalization and predictive features. Innovation begins to happen on a platform level, rather than an isolated, product-focused one. Waze is a system which does something basic mapping systems couldn’t—and which was definitely not possible in the age of traffic radio and paper maps: it connects various drivers to each other in real time. Waze is a system which does something basic mapping systems couldn’t—and which was definitely not possible in the age of traffic radio and paper maps: it connects various users to each other in real time. Specifically, users can quickly report traffic accidents, police, speed cameras, road hazards and the like—allowing a driver like me to save 15-20 minutes on my average commute. While most navigation systems were designed to help people avoid getting lost, Waze was designed specifically to help people avoid traffic delays. This difference in paradigm led its designers to focus on the users’ need to know about non-permanent objects and events which are out of sight or around the next turn—like the vehicles Waze constantly lets me know are stalled on the roadside or blocking a lane. To accomplish this, Waze connects drivers into a rich, user-augmented web that combines both artificial-intelligence-generated routes and instantaneous edits based on human input into the same system. Waze connects drivers into a rich, user-augmented web that combines both artificial-intelligence-generated routes and instantaneous edits based on human input into the same system. Google couldn’t afford to be behind the social mapping curve, so the acquisition made sense for several reasons: clearly, the algorithm helps users, but also, something about the interface and business strategy of Waze meant that they could gather a critical mass of users. Although Google could likely have done either themselves, they chose to acquire Waze instead and secure their position as the leader in mobile mapping. In this phase (between the IoT and the SNT), we’re making better use of the network effect of coordination between various people and devices. Here, we’ve improved on old functions and devices but we’re also able to do new things—like communicate with other drivers about traffic while we’re on the road, and selectively share information about ourselves with others—in ways which require a more robust network infrastructure, real-time machine learning, and many data points for the best prediction. Policymakers are taking on the shift to the SNT, quickly moving to prepare for its implications. USA Today published an article on March 13th, 2014 about California’s push to launch regulation for driverless cars. In it, the author notes that the Department of Motor Vehicles pledged to have draft regulations out by June and acknowledged that it had to have regulations finalized by the end of the year. In a state plagued with bankruptcy, it was a challenging deadline. Just 10 weeks later, FastCompany reported that autonomous vehicle regulations had been released well in advance of the promised timeline, and would be active by September 2014. It's easy to suppose that such a quick turnaround was influenced in part by the large public policy presence of technology companies and media attention on the promising future of automated vehicles. As the Social Network of Things becomes more prevalent, the Cyborg Age will come into fruition. At this point in our future, we can expect the conversation about technology to become more complex than discussing the devices or software we use, because such tools will become nearly indivisible from ourselves. Unlike Google Glass or Oculus Rift, devices which add an information layer to our daily experience but which we can easily remove, the technologies of the Cyborg Age—some of which are already here—will not be so easy to turn off. Our first forays into this age started when we began implanting inorganic technologies in our bodies, like pacemakers (or attaching them, like prosthetics). The apex of the Cyborg Age, however, will be marked by technologies like wetware—neural implants, for example—and nanotechnological chemicals and devices entering our bodies through our blood. Imagine being able to download an entire language in seconds—or, more likely, to just “know it when you need it” with no additional thought. Imagine nanobots which can remove plaque from arteries or repair torn ligaments. If you are concerned (and maybe also a bit excited), you are not alone. The Cyborg Age will be defined by discussions about ethics, artificial intelligence, neuroscience (a burgeoning field even today), robots and the digital divide. The division between the vast amount of data we have access to and our physical brains may be very hard to distinguish. The Cyborg Age will be defined by discussions about ethics, neuroscience (a burgeoning field even today), robots and the digital divide. We will also have to begin to accept the idea that artificial intelligence technologies which we create may begin to be sentient—aware of themselves and conscious. The emergence of self-aware artificial intelligence entities would force us to consider core issues of personhood, humanity and rights. At this point, the division between the vast amount of data we have access to and our physical brains will be very hard to distinguish. Neural and direct-to-organ technological interfaces will be either commonplace or at least commonly discussed, and network access will be pervasive, robust and incredibly reliable—at least in privileged areas. A person’s access to data and bandwidth, and how reliable and high-quality that access is, will directly correspond to the amount of socioeconomic privilege they have. As it becomes more difficult to distinguish between people and the tech that enables their lives, fundamental questions of humanity and fairness come into focus. These questions are largely about relative issues, rather than functional or strategic ones. What is fair? What is natural? How we do we decide whether we should do the things we are now capable of? How and when do we stop before we modify ourselves too much? What is too much? At the same time, tech-enhanced systems and individuals will have changed our expectations of capacity and function so deeply that a machine or human on their own will seem archaic and incredibly limited, and our concept of what is human will adapt accordingly to include modifications which have become commonplace. This is already happening. For example, there is an expectation that professionals will have and know how to use smartphones to enhance their memory, access to data, and availability—it is hard to find an executive today who relies solely on desktop computers for access to email or carries a paper calendar for scheduling. In most domains, machine intelligence and robotic production methods will be accepted and preferred over the work and discretion of “pure humans”, but emotion and empathy will become more openly valued as qualities which are exclusive to humans. As a result, the Cyborg Age will necessitate many roles which put the emotional intelligence of humans to work filling the emotional gap in cyborg and artificial inteligence capabilities as coaches, counselors and empathy experts. These considerations may seem like science fiction now, but so did the idea of a smartphone which can translate signs and languages instantly even ten years ago. How much do we modify biology? How far is ‘too far’ to evolve? How do we put on the brakes? What happens if the line between the human being and its technology is no longer distinguishable? The move to integrate tech into our bodies and daily experiences is complete, and the shift now moves towards extending and exporting ourselves into our digital environment—for example, uploading our minds into the cloud. At the post-human stage we’ll be dealing with pervasive artificial intelligence, major existential crises, fundamental paradigm shifts, and more questions about economic upheaval, bodies, and human beings in general. Now we get to the things that we’re seeing in our science fiction films and books right now, what we might call the Post-Human Age, or Singularity, in which the line between humans and tech is no longer distinguishable. While its feasibility is heavily debated, the Singularity concept is researched enough to be worth consideration. Championed and explored most prominently by the work of futurist, author, engineer and inventor Ray Kurzweil, whom Google hired in 2013 as their Director of Engineering to work on machine learning and language processing, the Singularity poses major challenges to the fundamental conception of being human. At this point we’ll be dealing with pervasive artificial intelligence, major existential crises, fundamental paradigm shifts, and more questions about economic upheaval, bodies, and human beings in general. The move to integrate tech into our bodies and daily experiences is complete, and the shift now moves towards extending and exporting ourselves into our digital environment—for example, uploading our minds into the cloud. We’ll be dealing with such complexity of emotion and systems that we’ll become reliant on intuitive information about the future, because the machine can predict things faster than our human consciousness could, and what is “human” has been redefined—or deprecated—to the same conceptual space traditionally occupied by “primate” or “ape”. Intelligence becomes largely separable from the body, and the term “human” changes meaning to include non-biological systems and devices which are not even confined to our physical forms. 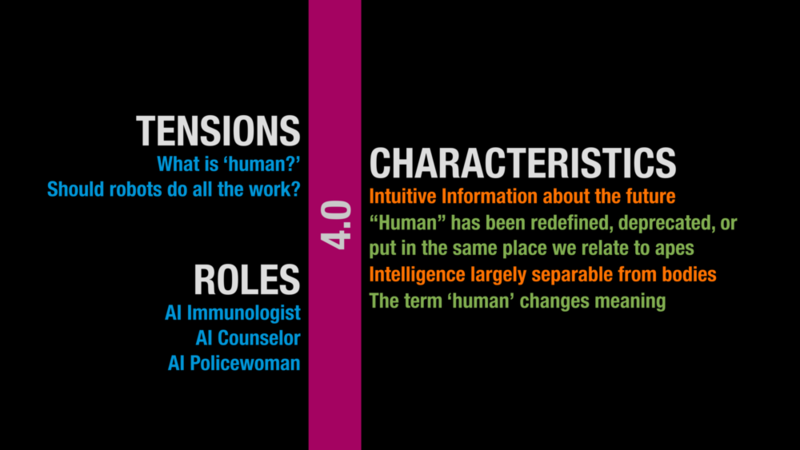 With the reality of sentient AI’s comes the need for experts and services to support their health and regulate their role in society, such as AI immunologists who address the impact of digital viruses on sentient digital consciousness and AI law enforcement to handle the risk of criminal activity which happens at speeds and levels of complexity which make it impossible for “human” police to track or intercept. Should robots do all the work? These futures are not a given. Both the positive and negative aspects of what I have described are only some of the possible scenarios for our trajectory as human beings. The bright, shiny, positive elements—interoperability of devices for coordinated savings of energy or increased safety, for example—are shadowed by concerns about ethics, privacy and environmental sustainability. For example, is it really a good idea to make it easier to drive petroleum-based vehicles, or should we switch to different modes of transit or at least energy sources? Just because we can make it easy to forget our laundry in the washer or have our home pre-heated or cooled so that we are never inconvenienced or uncomfortable doesn’t mean it is a good idea. The science-fiction examples of tech-enhanced bodies are also questionable in their benefits and consequences. Huge advances in standards, ethical guidelines, regulations and cultural understanding are needed. These problems are explored in incredible depth in other articles and resources. As technology-aware businesspeople and concerned citizens, it is our job to ask both what is needed to enable these technologies and also whether we are ready (or interested) in doing so. The ever-growing “snowball effect” of technological change is hard to counteract, but if it accelerates too quickly, cultural backlash or public misunderstanding can set back progress or derail legitimately socially-conscious innovations along with those under critique. In order to build such technologies, robust and well-designed technological and strategic platforms must be put into place. Legacy systems must also be integrated in a way which acknowledges complex privacy, speed and reliability needs inconceivable at the time of the original design. This kind of innovation and rapid change requires companies which may never before have had to consider such complexities to quickly deepen strategic partnerships in technology, public policy and many other functions while also increasing their own capacity.